When your miles are dropping off and you can’t seem to find the mental fortitude to log those long runs, what do you do? Well, this is the place I found myself in this summer. I was certainly willing to go out and run, but something was happening around the 2 mile mark: I just lost all of my determination to keep on going. 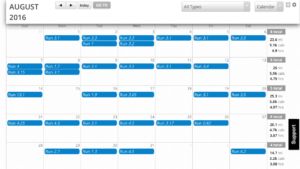 I try to keep my combined training and race miles above 100 each month, but for some reason, I just could not string together the long training runs to which I am accustomed. 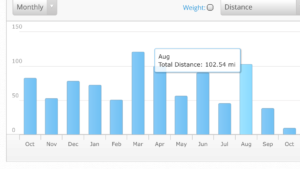 In fact, in March I hit a high for the year of 120.2 miles, and its been all downhill from there. While there was a drop-off from the March high water mark, April was solid, as I just barely missed hitting 100 miles and had a great month of races. 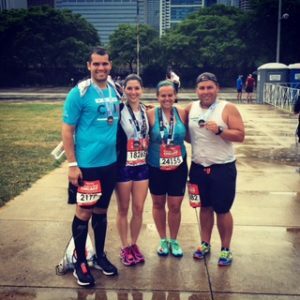 But May through July were a roller coaster for me, with a mere 45 miles in July – and that includes the 13.1 miles I logged during the Rock N Roll Chicago Half Marathon. I knew I needed to do something to break out of this funk, but what? Step in the 5k a day challenge. Nick suggested this, and Candace was on board, so we thought we would give it a shot. The premise was simple enough: forgo the long runs and commit to going out each and every day during a calendar month and run at least 3.1 miles each day. At least it sounded simple enough. This is a story about how the challenge it went for me. Everything started out great! I felt fresh, and, to be honest, telling myself that I “only” had to run 5k really helped motivate me (as opposed to setting out to run 10k or longer). I felt so good that 2 out of my first 3 days saw me logging doubles. I was off and running (see what I did there?) to a great start. Week #2 started out right where #1 ended. The first day of the week I went out, and, to be honest, was not really feeling it. I made it a mile and, just kind of gave up and went home. I felt like I was pushing myself too hard. However, not wanting to give up on the challenge, I was able to motivate myself to go out later that evening and log a 5k, pushing my daily total to 4.1, which made me happy. Buoyed by the challenge itself, I had no problem logging my 5k for the next several days, and even managed to add a few .1s to several of my runs, which really do add up to help push your monthly totals that much higher. I knew, however, the weekend was going to be a challenge. 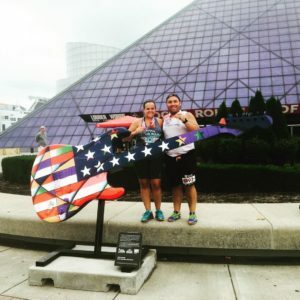 On Sunday Candace and I were set to run the 2016 Rock Hall of Fame Half Marathon in Cleveland, a race that we were both very much looking forward to. However, a few days before, I started feeling the run streak (and the lack of rest) starting to take a toll on my legs. Without proper recovery days, my legs grew more fatigued and I just did not feel fresh to start my runs. Saturday, the day before race day, I had commitments all Saturday morning and we planned on going to a Cleveland Indians game Saturday evening, which left us a small window in which to log our 5k that day. Rushed, I hurried up to change and head out to the running trail. Everything was a mess. My headphones were not working so I had no music. It was humid and the temperatures were already in the high 80s. My GPS watch would not sync. Ugh, I was so frustrated. 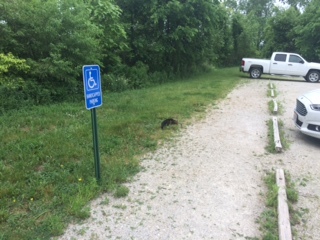 I tried to run anyway…and…just…well, I gave up up. I threw in the towel. I knew that day was not my day. You know what? That’s ok. Sometimes you do not have it. And, just like that, my streak was over. In that moment I realized that, while running a 5k every day for a month may not sound that difficult, it really kind of is! The next day I ran the 2016 Rock Hall of Fame Half Marathon and I just did not have the legs for it. I started cramping up around the half way mark and did not have it in me to put in my best performance. I simply did not get the rest and recovery I needed before the race. Lesson learned: this challenge does not go well for me in months in which I plan on racing longer distances. I tried bouncing back by starting out the next day with a 5k and…well…yeah…my legs definitely needed a recovery day. I tried running, but my legs just were not having it. So again I threw in the towel. I tried coming back the following day, and again, my legs were like Jello. I made it 1.9 miles and just could not push them any further. This challenge definitely taught me the lesson of humility and a great appreciation for rest and recovery days. I did bounce back the next day with a great 3.65 mile training run, but found myself feeling too sore the next day to run. Geesh. So another rest day it would be! I am glad that I made this decision as another rest day was just what I needed to set myself to end the week with a streak of 3 consecutive 5k days. I should also note that, on the days I did not run, I did walk at least 5k, but as I had decided from the outset to not count walking miles, from where I stood, my attempt at this run streak would officially fall short. I would not say it was easy, but I kept the streak going to start off week 4. By Tuesday, which was the 5th consecutive day, I had to push myself to get to 3.1 miles and barely made it. For some reason, I was also ravenously hungry. This run streak was certainly spiking my appetite (which is not a good thing when you are trying to shed some pounds heading into the fall race season). Ok, so I knew heading into the final few days that the streak was over and there was no way that I would hit my initial goal for the month. But, something happened along the way. Instead of giving up, I resolved to finish the month out as strong as I could and at least hit the total mileage goal that I would have achieved had I fulfilled my original goal. In the end, this wound up being the motivation I needed to keep myself going and log the miles to achieve my best monthly total all summer. This was all the victory I needed to be satisfied with my effort. So, what did I learn from this experience? Well, please let me share a few words of advice for anyone thinking of taking on this or any other challenge. First, define your goal. For me, the goal was to run 3.1 miles each day. This means I did not intend on counting any walking miles. Others may choose to count walking miles, that is up to you. However, whatever you decide, define your goals from the outset and be honest with yourself. A challenge goal is to motivate yourself to achieve great things. The only one with whom you are competing is yourself. Second, be honest with yourself and do not allow the goal to so consume you that you forget to enjoy yourself. There were days where I just knew that I did not have it in me. Rather than beat myself up, I just listened to my body and took the break that I needed. Third, if you fail to achieve your goal, do not give up. Even though I knew, part way through the month, that I could not achieve my goal, that was no reason to stop altogether. I regrouped and kept pushing myself. The goal/challenge may have been gone, but the determination to benefit myself through training was not. Oh, and one last thing. 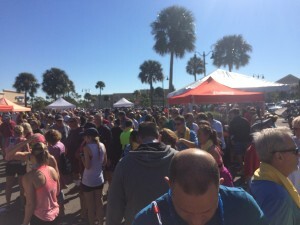 When I told some fellow runners of my 5k/day challenge, several of them responded by saying something along the lines of “well, that is nothing.” I can say that this challenge is not “nothing,” but it is quite difficult. Don’t believe me? Give it a shot yourself!